Check out this winter math project! 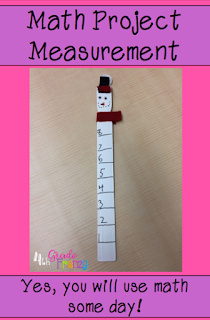 This easy to make snow measuring stick is a perfect project for students to make during the winter months. 2. Students paint them white on one side and allow to dry. Paint the other side, and allow to dry. 3. Using a ruler, have students mark off inch or centimeter marks with a pencil. 4. After the teacher checks the marks for accuracy, have students go over the inch or centimeter marks with a Sharpie. 5. Students add creative details to their snow person stick. We used wiggle eyes, felt, foam, and Sharpie details. Allow to dry again. 6. Wait for it to snow, and measure how deep it is! Now there is some real world math!